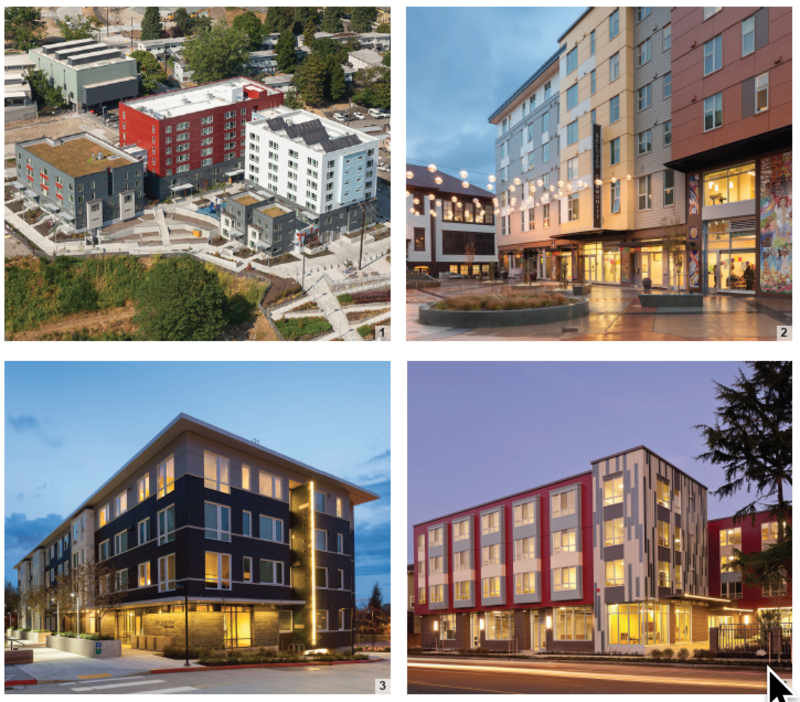 Four views of the new addition to the Lam Bow Apartments on Delridge Way SW. The Seattle Housing Authority is the agency behind the proposed expansion of the Lam Bow Apartments at 6955 Delridge Way SW. The apartment complex suffered a devastating fire in September of 2016. 35 people lost their homes in the blaze and the proposed new expansion will look to expand and improve on the existing buildings.The project is currently under Administrative Design Review. It is being designed by SMR Architects. The Lam Bow Apartments project is a unique opportunity to improve a large parcel currently owned by the Seattle Housing Authority and increase the number of affordable homes within the Delridge neighborhood of Seattle. Many massing and parking configurations were studied before the preferred scheme was realized. The project aims to create a sense of community and meaningful opportunities for social engagement and interaction among residents through thoughtful design. Children are a unifying force for social interaction and the design focused on placing their play opportunities at the heart of the project to foster this interaction and provide a safe environment for play. By placing the building on the north lot and the parking on the south lot, a large central open space can be created. The double horseshoe configuration between building and hardscape will provide protection for, and activation of, the large open space which acts as the heart of the project. Income (AMI) and 60% of AMI. • Create safe, family oriented outdoor amenities to serve the building’s residents. • Design common room and office suite to act as an anchor between the interior and exterior common spaces buildings while providing visual connection to outdoor amenities, parking lot, elevator, and entry. • Provide surface parking to support large households including working families and visitors. Due to the site’s liquefiable soils, the cost of underground parking is extremely high in proportion to the construction cost, thereby limiting the quantity of affordable housing that can be achieved on site with the same budget. The parking configuration has been carefully studied and designed to respect the neighbors and create high-quality open spaces on site. Early Design Guidance packet can be downloaded here.